The trend in the meat chicken industry is to produce more chicken meat from less feed in less time. The most common chicken breed used in commercial enterprises today, the Cornish Cross, can put on weight twice as fast as domestic chickens could a century ago. Consumers will recognize this bird by its huge breast and white feathering. Most Cornish Cross industry chickens reach market weight sometime between four and eight weeks, depending on the desired weight for slaughter. Unfortunately, fast-growing breeds of chicken are associated with a host of issues; both producers and consumers are becoming more concerned. First, the quickly accumulated weight can overwhelm the young chicken’s bone structure, causing deformity, pain, and difficulty walking. The Cornish Cross’ large breasts also make them heavy in the front, complicating their mobility even more. Other than the physical issues faced by fast-growing breeds, there is also a welfare component to their short lives. To accommodate their rapid growth rate, these birds are driven by an insatiable hunger that keeps them parked in front of their feeders. Selective breeding has also led to more docile chickens that cannot fend for themselves. With their poor mobility and need to consume high-calorie foods, fast-growing breeds often do not thrive on pasture. Unfortunately, when these birds are given access to the outdoors and pasture, they tend to be poor foragers, having lost most of their natural instincts to scratch, forage, and socialize with their flock-mates. In crowded and stressful environments, feather pecking and cannibalism are common. Even if a particular flock of fast-growing birds does not seem to suffer from these health problems, the breeder flocks that supply these farms with chicks virtually always compromise animal welfare. 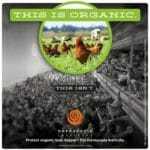 As of yet, there is no requirement, even in the organic marketplace, to have chicks managed organically at birth. Chicks can be left without food for days after hatching, and mortality can be high. Slower-growing breeds like the Red Ranger and Freedom Ranger are gaining in popularity. These birds take about 12 weeks to reach market weight. They are popular in pastured operations because they tend to have good foraging instincts and are more physically active. Other heritage meat breeds can take anywhere from 18 to 22 weeks to reach market weight. Due to their greater vitality, slower-growing and heritage breeds often enjoy a better quality of life than the industry standard. The cost of production is higher in slower-growing varieties. 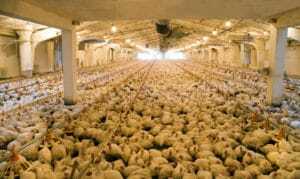 They consume more feed per pound of meat produced and do so more slowly. Big-industry proponents argue that the poorer feed efficiency has implications for sustainability and environmental impact. Many producers also have concerns that the American public will not accept the product of a slower-growing breed. While slower-growing chickens usually have richer flavor (due to a higher percentage of dark meat), they tend to have larger thighs and smaller breasts. 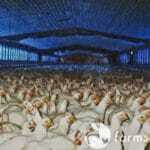 Despite these production costs, it may be worthwhile to choose a slower-growing chicken for health reasons. One study testing the difference in meat quality and nutritive aspects among slow- and fast-growing breeds found that the quality of the meat was higher in the slow-growing breeds (e.g., lower in fat, higher in protein and alpha-tocopherols). Slower-growing breeds grown using organic practices are nutritionally superior and have lower levels of agrichemical and drug residues. And the welfare benefits for the birds themselves cannot be denied.